» If not a street fee, what? If not a street fee, what? If you were hoping that the potholed streets in the older parts of Albany might some day be repaved, you can expect to be disappointed. The city government has no plans to do anything about this worsening problem, at least not yet. In Portland, they have the same problem, only bigger because they have more old streets and more traffic. There the mayor, Charlie Hales, and one of the city commissioners, Steve Novick, proposed to do something about it. They asked the city commission to adopt a street utility fee. The fee would cost a typical household $140 a year. Businesses and industries would pay depending on estimates of how many car trips they generate. The problem with street fees is twofold: They violate the spirit of the state constitution, and they are unfair. They circumvent the tax limitation of Measure 5, adopted in 1990. And they affect property owners in an inequitable way. An aged widow who owns a house but no car and takes a taxi to the store once a week pays the same fee as her neighbor in a house with five cars and three teenage drivers. Still, you have to give those two Portland politicians credit for getting the urgent need for street maintenance and restoration on the public agenda. The Main Street project would get urban renewal money. In Albany, next year’s budget, now being reviewed, makes no mention of a solution. 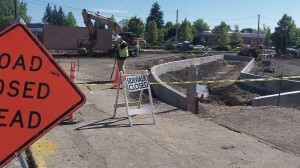 Instead, it proposes to redirect half a million dollars from the street capital fund to the general fund, planning to make up for this loss by letting the urban renewal program pay for half a million dollars of the expense of rebuilding Main Street and constructing a roundabout there. Shuffling money around does not get the old streets fixed, though. And as long as nothing is done, they will continue to fall apart. The city manager’s budget message for 2014-15 says Albany city government continues to face increasing personnel costs, new regulatory requirements, and population growth that places “more strain on already stressed transportation and service delivery systems.” And it says continuing staff cuts and efficiencies won’t be enough to meet future needs. 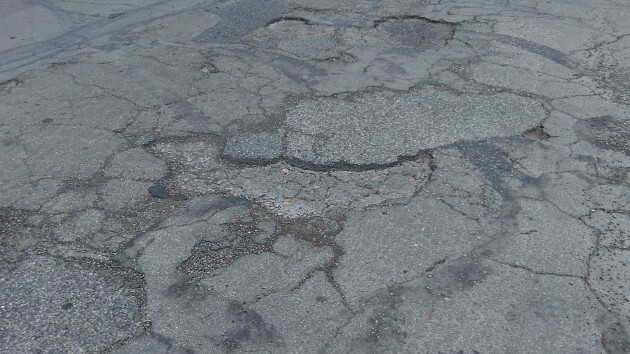 When I arrived in Albany from Orange County CA over five years ago, I was surprised at the deteriorated condition of so many of the city streets. When later my husband was driving me to the hospital for a post-op exam, I begged him not to take that potato field otherwise known as Hill Street between Queen and 24th! City government is certainly remiss in the street repair area.